His last 600m of 35.90s was 4.5L quicker than the next best in the race, which was the second placed Accession (36.59s). Espaaniyah sped along in front again running a fast 34.95s for the first 600m. That’s quick on a good track, let alone a soft one. “This is what we do it for, this is what we get up in the morning for, and this horse is the real deal. Unbelievable,” said Litt, who has been training for three years under his own name. 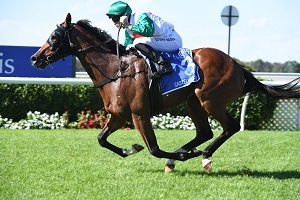 Being an Inglis restricted race, the prizemoney from the race doesn’t count towards the Golden Slipper so Litt is already eyeing off the G1 Inglis Sires (1400m). “We wont push him and rush him to the Slipper, we’ll just take our time and see where he takes us,” he said. The 29-year-old, who spent time under Graeme Rogerson, John O’Shea, Bart Cummings and his father Jim, concurred that the win could be life changing, cheekily suggesting that he might be able to buy a few more horses at the Inglis sales tonight. “They say ignorance is bliss and that’s certainly the case with this horse, he is so raw. He has no idea what this is all about,” gushed Parr. Accession was brave in defeat, after jumping quickly Hugh Bowman had to take hold before they pair were swept wide on the turn. 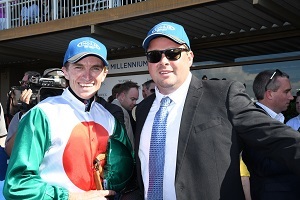 “I thought his run was every bit as good as the winner,” quipped Bowman. Meanwhile, Blake Shinn also pointed to the Inglis Sires as a perfect option for Dawn Passage. “He ran super and hit the line really well, just had a traffic problem throughout the race but that’s due to his racing style of getting back in the ruck,” said Shinn.